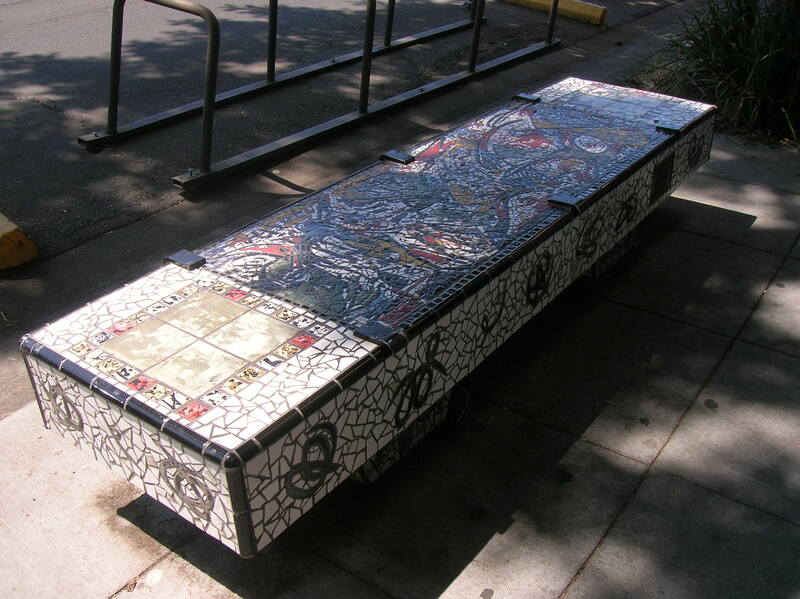 This bench was commissioned as part of the City of Chico’s Downtown Luminary Art Benches project. 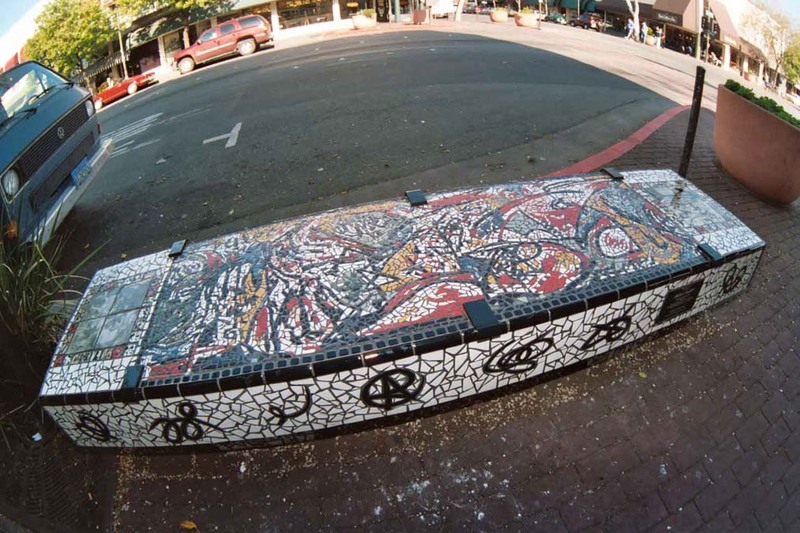 The Arts Commission approved five proposals by five different local artists to represent five different luminaries who had some kind of connection to Chico. 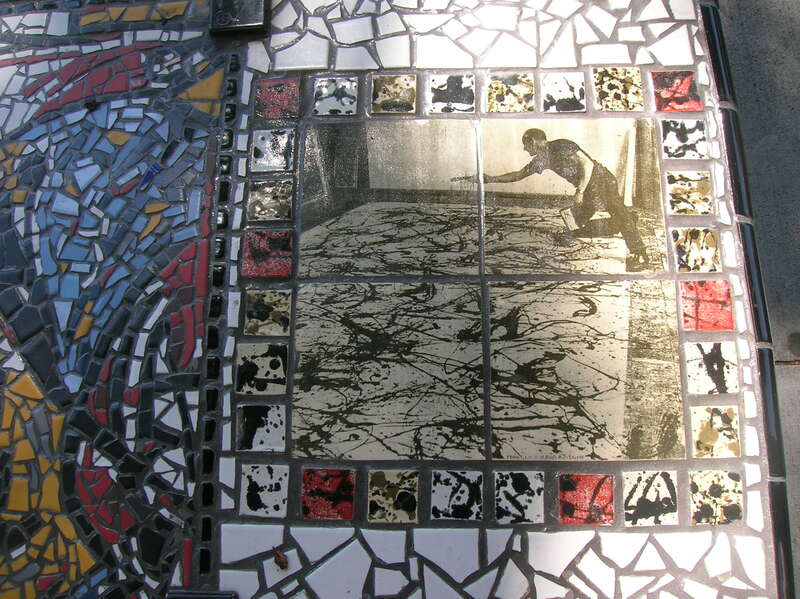 Jackson Pollock was one of the suggested luminaries in which to honor because he had lived in Chico as a small child. 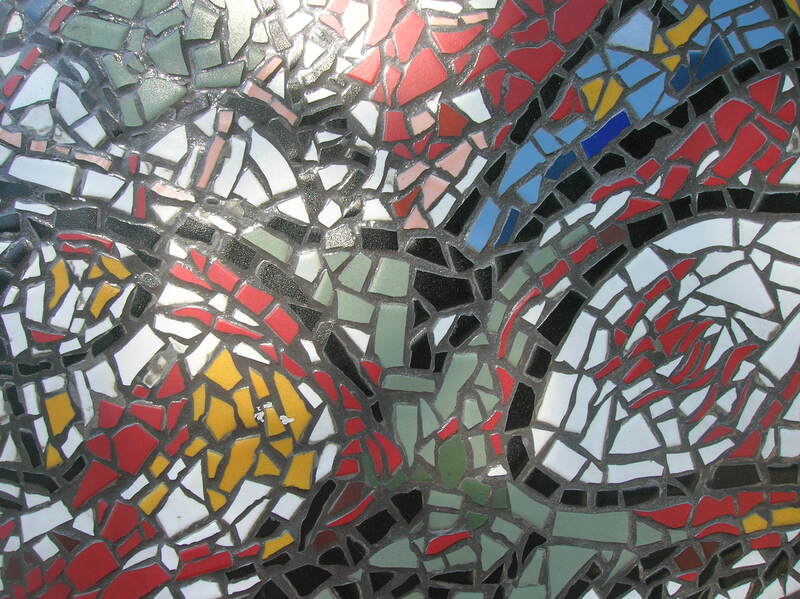 There were several copyright obstacles to overcome before the bench could be created. 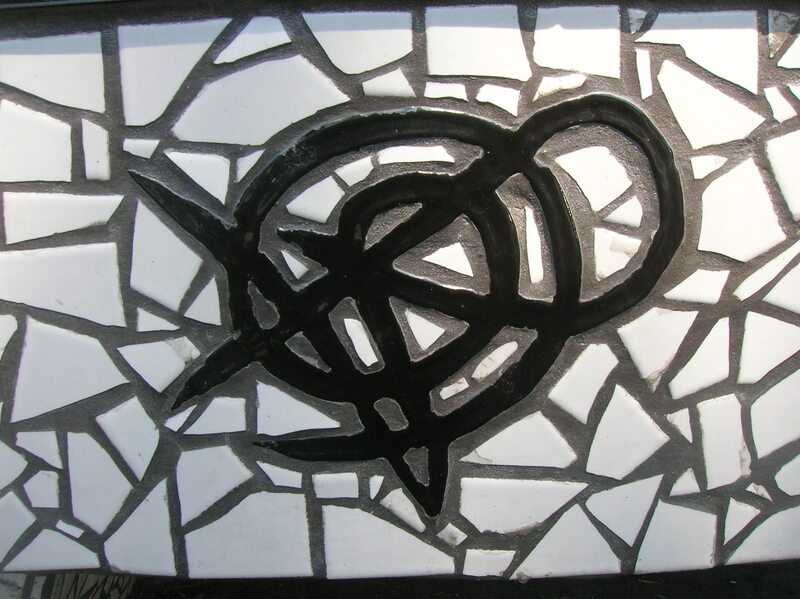 I had incorporated silkscreened images (of Pollock) on tile into my design which meant I had to contact the photographer who had taken the pictures of Pollock and ask for approval to use these images. 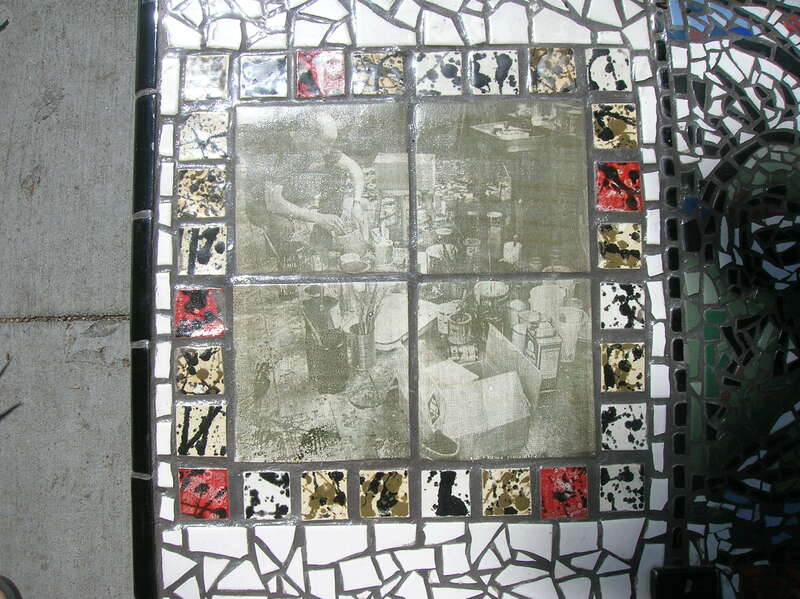 Then I had to get approval from the Pollock-Krasner Foundation through their agency to even allow for a bench in his honor to be created. 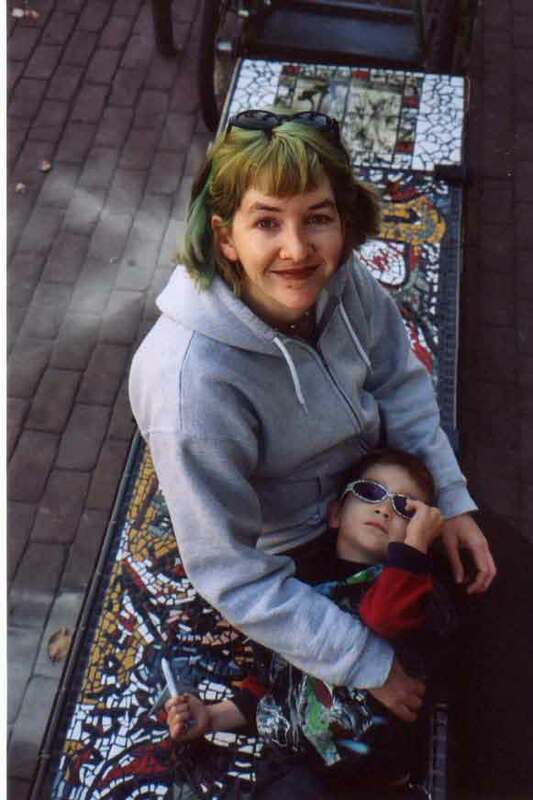 By the time everything was approved of I was nine months pregnant with my second son and it was the blistering hot summer of 2004. I was spending all my waking hours out in the hot garage stooped over this eight foot long concrete slab. 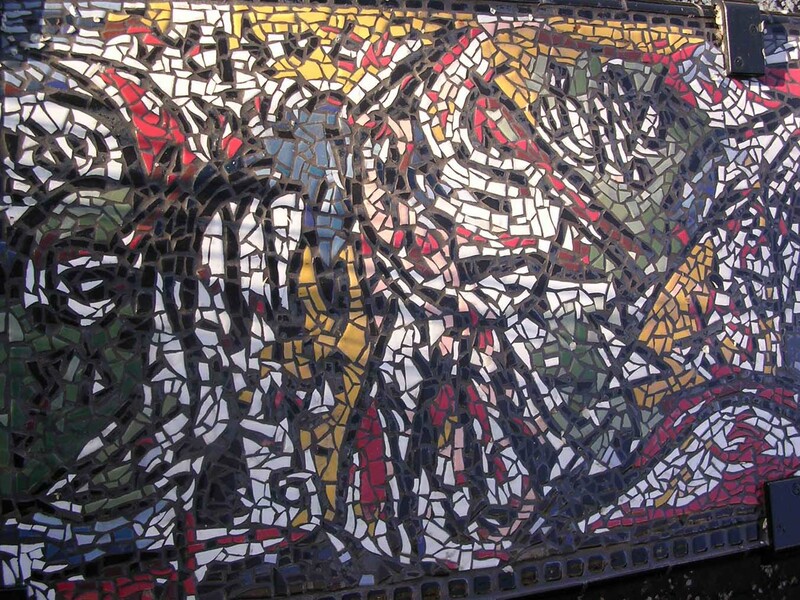 I made a five foot long mosaic recreation of his abstract painting “Water Bull” to go in the center with the silkscreened tile portraits on either side. 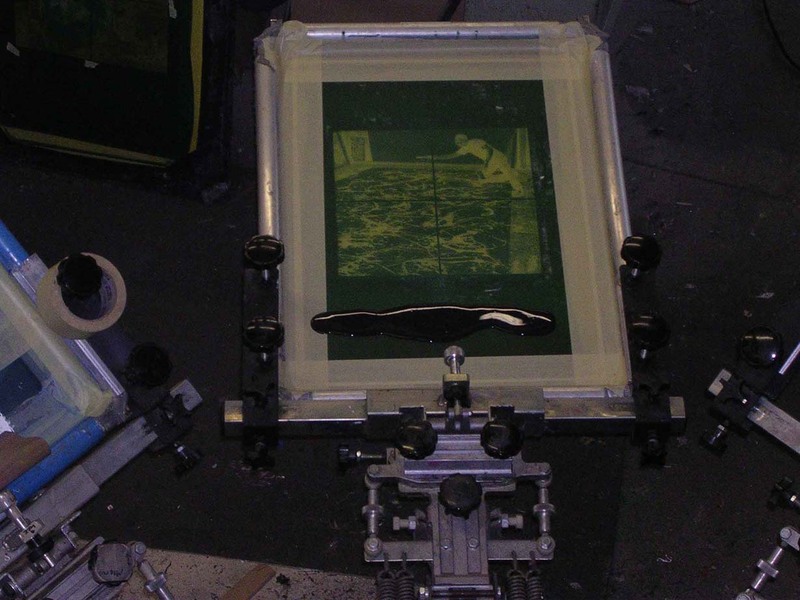 Jeremy from Sun Dog silkscreening helped me make those. 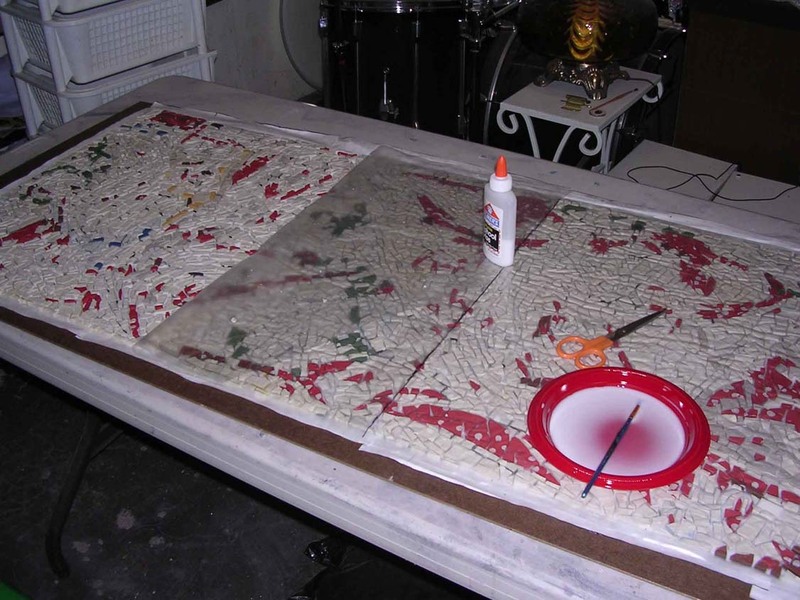 The first one is of Pollock stooped over his many paint cans in his studio and the second one is of Pollock swinging a big swoosh of paint high in the air over his canvas. I carefully cut each 12″ portrait into 4 smaller tiles for the bisque firing and later fired them with a clear glaze over the top. This was before I had my own kiln so I was hauling all of these fragile tiles over to my friend Dorna’s to fire which I wouldn’t recommend to anyone. I like to say unfired tiles are just dust held together with magic. They should be moved with great caution. 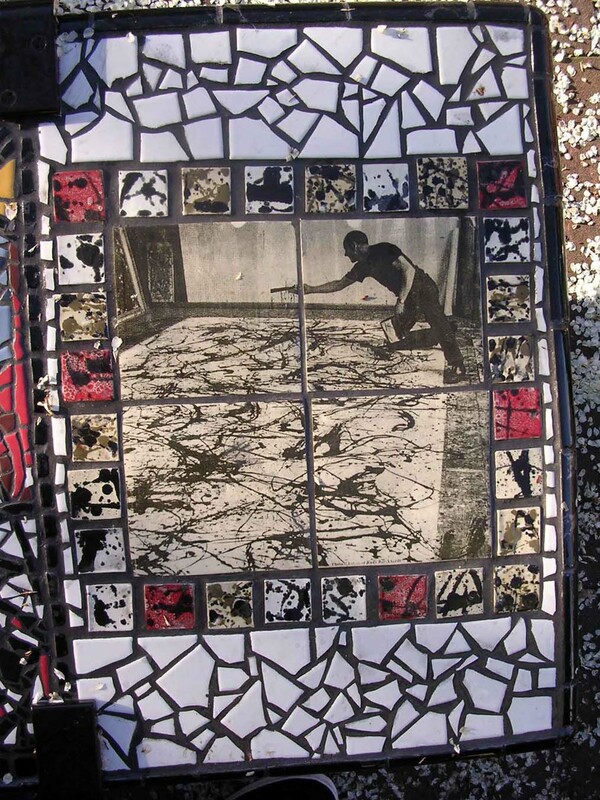 I surrounded the portraits with 2″ square splatter tiles I made and covered the vertical edge of the bench with cut-out tiles of squiggles that were meant to mimic his splattery painting style. 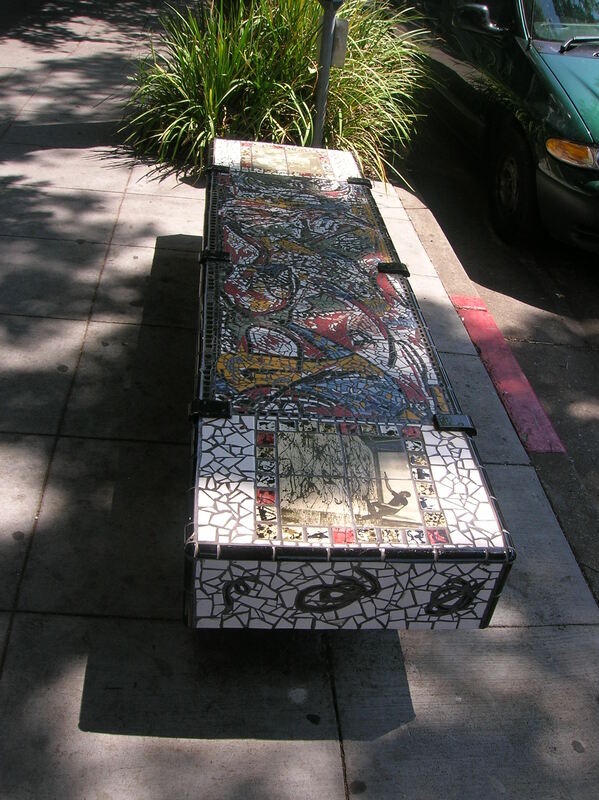 The bench was installed in January of 2005 right in front of a ritzy boutique on Broadway and 2nd. 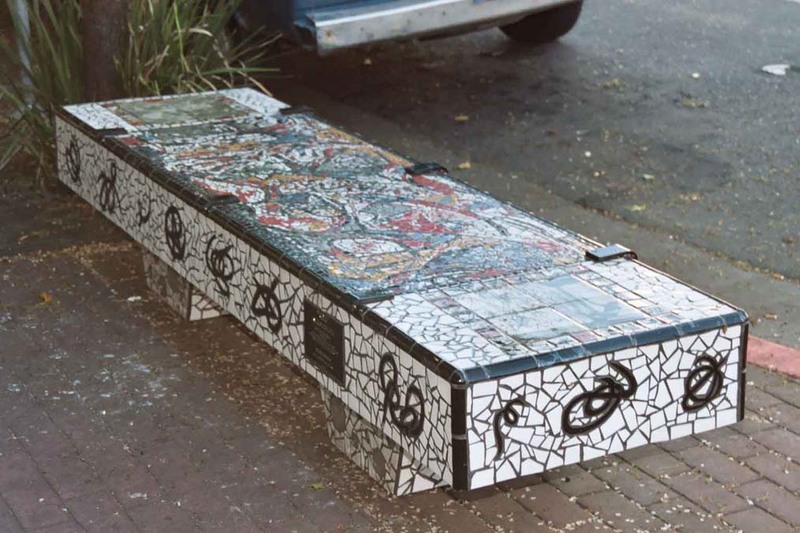 Immediately after it was installed a homeless guy named Jim took up residence on it and could be found there everyday. The shop owners had a problem with that so the bench was promptly moved across the street. The funny thing was, Jim continued to reside in front of the shop bench or no bench and was there until the winter rains moved him along. I think Jackson Pollock might have enjoyed all the controversy.